MLT is capable of laser machining, cutting, and drilling many thin rubber and foam products to exacting tolerances. 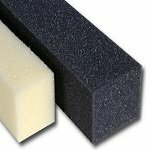 Specializing in the laser processing of thin, flat, sheet or roll stock, laser machinable rubbers and foams are limited to thicknesses below one inch. A subset laser machinable metals and metal alloys are listed below. If required, material certifications can be provided to document compliance to military, food and drug, automotive, and aerospace standards. Additional specification compliance for plastics may include FDA, ASTM, ASM, Mil-Spec, and UL.